I absolutely love the work I do each day; given the choice, I wouldn’t pick any other field, which feels pretty awesome after following an unexpected, winding path to get here. (When I started the blog way back in 2008, I had just graduated with a Master’s degree in Social-Personality Psychology and was working as a researcher.) If I could take on a few more big projects right now, I would in a heartbeat because lately the inspiration never stops! It seems like Eric and I discuss new ideas every week. If you’re curious, some of the ideas include: creating cooking videos, redesigning the blog, opening a cafe or juice/smoothie bar and delivery service, creating a meal plan service, writing a children’s book (seriously! ), starting an apparel line, growing our recipe app, taking food photography courses, and the list goes on and on. But then reality sets in and I know my priority has to be keeping my head above water, and not biting off more than I can chew. So lately, I feel like I’m in this confusing place with my career. I’m decent at judging how much I can take on, but still find myself yearning to do more and lagging behind the speed of my dreams. This passion makes it easy to feel like there isn’t enough time in the day. Throw motherhood into the mix, and it’s even more of a juggling act; my parenting and self-employed roles are 24/7, always on call, with problems popping up just when I think things are going smoothly. There are big highs and lows, often in the same day. This is part of what makes life so rewarding though, and it fuels me to want to improve—or at least on the worst of days, to work on my patience and practice a bit more self-compassion. As I mentioned in a recent post, Eric and I have talked a lot about whether we should take the next step and grow—such as by hiring a small team—although it feels almost as daunting as it does exciting. That said, I hired an editorial intern earlier this year, and it’s worked out very well! Part of me now realizes that a whole team of inspiring minds would be something absolutely amazing, but I guess I don’t know how to make that happen with a second baby, book, and renovations all happening this year. When is the right time, and is there ever a right time? Or, do I simply accept what I often read: that my career is destined to be in “maintenance mode” for the time being as a new parent? Do I dive in headfirst or start small and take baby steps along the way? I’ve been following the latter approach for years; even though it feels right to my practical mind, I get impatient at times. There’s no real point to this thinking out loud today, other than to share what’s on my busy mind, and to remind myself that this journey is a work in progress. And it will always be. Maybe you are struggling with similar questions or wondering how to juggle various priorities in your life, too. We’re all doing the best we can each day, trying to make good decisions; they don’t always work out, but some will exceed our wildest expectations. It often feels like other people are doing more or growing more (a feeling that the internet seems to multiply a million times over! ), but they’re probably feeling just as confused and taking it one day at a time like most. At least, that’s what I like to tell myself! Plus, I’m a firm believer that life isn’t a competition; we can build each other up to achieve success, no matter how we personally define it. When my brain is running a mile a minute, simple meals are where it’s at. Especially in the summer. That’s why I’m so excited to share this easy salad from the Love and Lemons Cookbook. I made a few small changes (such as omitting the mozzarella, increasing the balsamic vinegar, and swapping toasted pecans for sesame seeds). This salad is right up my alley, and I think it’ll be a new favourite for you as well! I’m a big fan of Jeanine and Jack’s blog and their simple approach to cooking with seasonal produce. You can’t help but be inspired to eat more veggies when you visit their site. 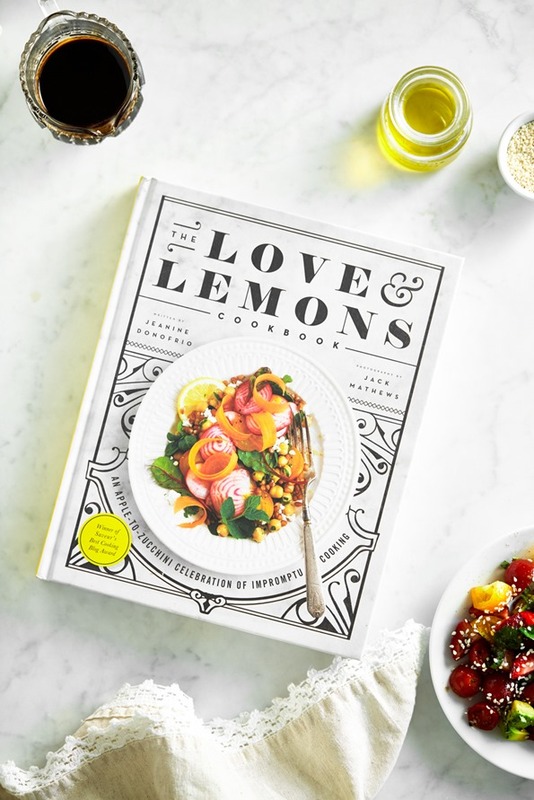 Their first cookbook, Love and Lemons: An Apple-to-Zucchini Celebration of Impromptu Cooking, was released earlier this year, and it’s an absolute stunner from the design and layout to the food photography. Since the book is divided into chapters by vegetable (or fruit category like berries, citrus, and stone fruit), it provides plenty of vegetarian cooking inspiration when you just don’t know what to cook with that on-the-brink-of-death eggplant or giant bag of sweet potatoes you just impulse-bought at the store. Big congrats Jeanine and Jack! Meet your new favourite summer salad! 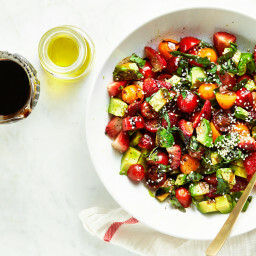 This delightful combination of strawberries, avocado, basil, and tomatoes is tossed with a touch of extra-virgin olive oil, and drizzled with homemade balsamic reduction for a refreshing, lightly sweet salad that's great on a hot day. This recipe is lightly adapted from the Love and Lemons Cookbook (2016). Nutritional info is based on 2 servings. Long-time reader here! Five years ago, your blog taught me how to cook/bake, and I’ll always be grateful! This salad totally caught my eye. I was wondering, what would you suggest I add, protein-wise, to make it a full meal? Hi Christine, I would say some marinated tofu would be lovely!! For a super quick option, chickpeas are always an easy addition, too. Hope this helps! Wow, this looks amazing. Strawberries are a great addition! I think I’ll add candied pecans too! Thanks! I hope you enjoy it, Sheryl! Carrie, what a beautiful comment! It brought a tear to my eye reading about your relationship with your daughter. I couldn’t agree more. And I love the reminder that we tend to compare our “behind the scene reel to someone else’s highlight reel” – isn’t that the truth! Hey Carolina, Thank you! I will definitely announce if we’re hiring in the future. :) You are so right there’s a ton of talent out there and we could do some pretty amazing things. As for managing time and deadlines, the thing that works for me the best right now (and it’s so simple) is to-do lists. I write a “weekly” goal list at the end of the weekend, and then daily to-do lists each morning (or night before). It makes me so much more productive and focused than I would be otherwise. I put long-term deadlines in my Google calendar with pop up reminders. Other than that, I’m really quite disorganized (such as email…laundry….my pantry, hah), and need to find some better systems in place. I was just struggling with what to make for a get-together I have coming up. This is perfect! Ohmygosh if you opened a cafe/juice bar, I would travel from Halifax back to my home province of Ontario to eat there in a heartbeat! I always kind of wondered whether that was something you ever considered, and it’s super exciting that you have! I know you’ve got a lot going on already, of course, but it’s always fun to dream about the future! Anyway, I just wanted to say I admire your drive and your commitment to following your heart and accomplishing so many goals! Your work has already inspired so many people on their way to healthy eating, and if that’s not something of immense value in this day and age, then I don’t know what is! Emma, that is so sweet of you to say! Well, if it ever happens, I’d be honoured to have a fellow maritimer dine at my cafe. ;) Thanks for your kind words! WOW! THE dreamiest of summer salads!!! Beautiful-looking recipe! Can’t wait to try it…although I may leave out the avocado, as I am not a fan. I seem to remember AGES ago that you had asked readers to let you know of any say… incongruous ads on your blog. One of the ads currently showing up is a “steak planet” video that shows somebody making a steak recipe. Thought I’d let you know, just in case! Thanks again for the recipes & inspiration! THANK YOU so much for posting about our book!! No problem at all, Jeanine! Thank you for creating such a beautiful book! I remember my mother telling me when I was expecting my 3rd not to sign up for anything in my 2nd trimester that I would regret in my 3rd. Meaning that those few months in the middle after the first trimester cloud has lifted and you have a lot of feel good energizing hormones don’t start big projects without the long view in mind. Her advice ended up being very timely because my 3rd son was born with unanticipated health challenges that were all consuming for our family for a good 18 months. I guess the lesson that I learned is that a new baby is such an unpredictable life changer, I try to maintain the status quo for the 6 months before the baby comes and the 6 months after if I possibly can. This keeps family relationships the highest priority. Good luck! It’s great to read about what you have going on, your dreams and plans and “maybes”! Just curious – what happened to the tea shop? It was on your site for awhile and it seemed to be getting going and now I don’t see it. Perhaps you decided to invest your time and resources into other pursuits. 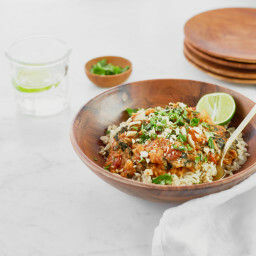 Loving the photography lately – the food pops off the page!! Hi Angela. I never comment because I know you are busy. But maybe you will read this and it will help you. I have been blogging since 2012 and I am at a good place right now. I have exactly same thoughts and conversations with my husband just like you. Same ambitions and I know I could do more BUT after I had my 2nd child my desire to spend valuable time and be present in my family’s life has only grown so much more. Way more than when I had only 1 baby. Now I had 2 and suddenly they needed me so much and I wanted not to waste any time. So, my future goals are a bit on hold. But youngest one is going to school in Fall and I am starting to see how in a few years I will get more done with my blog than just a keeping it in “a maintenance mode”. Honestly, that 2nd child was a big game change for me…Even discussing a web design change after they are in bed is tiring to me…and when they are not in bed is almost impossible LOL. I thought “oh, what’s a big deal. I already have one!”. It became different dynamics – me more busy with 2 kids, their interaction plus school and sports. But I wouldn’t miss it for anything. All the best with your decisions. Oh, and I do not follow much social media not to have any comparison thoughts. :) Fellow Canadian blogger. Hey Olena, Thanks for sharing your experience! It sounds like you have a great approach with it all. Hey Jess, That’s so awesome! If I’m ever in your area I will have to pop in for sure. :) Good luck with the rest of your pregnancy! Thanks Angela, same to you with yours! And if you guys take a weekend roady north do be sure to drop me a line – would be lovely to say hello and sip some virgin margaritas on the patio together! Beautiful! Can’t wait to try! I just made this salad for lunch and it was delicious!!!! Pertaining to comparing how fast your career path is moving or how much you have accomplished…I heard a wonderful quote the other day. On a tiny scale, I use this now in my daycare when the children check each others’ dishes and say it’s not fair that one has a bit more than another. On a large scale, it can apply to comparing your career or accomplishments to those of others. Waiting on accomplishing a dream or idea can be so challenging, especially with the thrill of a new idea flooding you with anticipation! Maybe a happy middle…not just maintaining your career, but not going for it all at once. Which ideas fit in best with having a newborn? A toddler and a newborn is a beautiful yet exhausting time….! If you map out all of your ideas on paper, you may find that some of them lend themselves to helping with others…hiring a small team or one person to maintain current projects would free you up to start a new one. He/she could then maintain that project as well which frees you up to start the next. You have full creative control and execution but the maintenance is handled by your staffer. As the projects grow, so could your staff. Just a thought! I’ve been a long time reader of your blog, and though I’m not vegan, I make many of your recipes. Perhaps I will be one day because I feel awesome when I eat only plant-based food. I will have to convince my husband to try it also. Some of my favorites include your overnight oats (all flavors) and your Best Shredded Kale Salad. I think I have a new favorite though. 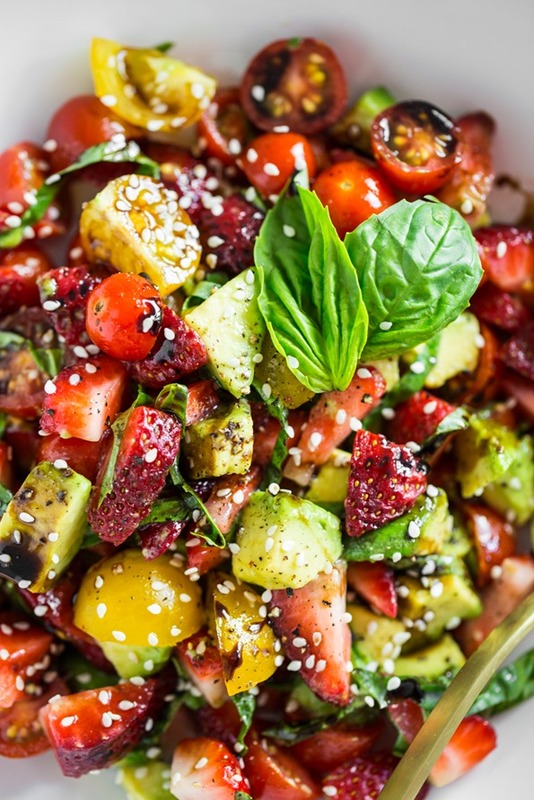 This Avocado Strawberry Caprese Salad is yummy! I didn’t even have sesame seeds to put in it, and it was still delicious! I also felt great after eating. I’m embarking on a new fitness routine and this salad was a perfect end to my healthy day. Only after I finished my supper did I read this post and couldn’t believe how similar I’m feeling recently. I just resigned from my teaching job to pursue writing full time. I’m excited to actually slow down and do only one job (writing) rather than two for a while. I admire all you’ve done with your blog and your cookbooks. Keep up the wonderful work you do. You’re making a huge difference in people’s lives. Thanks for the awesome recipes!!! Please be very careful with yourself as you expand your business and your family. I worked 24/7 for many years–loved what I did, had 2 businesses, young children and elderly parents needing care. Eventually I hit the wall and developed fibromyalgia, a very nasty disorder. The lesson learned is that you can probably do everything, for a period of time, but there will be payback eventually. Get help, prioritize, stay well. and enjoy your life; I love your food. Hi there, Do you mean what can you sub for the balsamic vinegar? I really don’t think there is a sub for that unfortunately as it’s a main component of the recipe. As for swapping out strawberries, I think you could have success with pitted fresh cherries or even blueberries! Just few hour ago i was thinking that, what should i prepare today for my kids. And if found your blog, now its look something which my child will love. Looking forward to try it. I hope it’s a hit, Shalini! I love your blog posts, your recipes, and your app. Enjoy your energy and enthusiasm. my dear. I am 76 and realize that strength and/or imagination can fail as life goes on! I love the recipes on the app but is it possible to add recipes from your blog to them? And would it also be possible to have a search on the app so that One could key in ingredients and have the recipe pop up? I can Google these things but it would be so much less cumbersome if ithese suggestions could be incorporated into the app. Thanks you for all you give us. This recipes looks lovely. Will find some basil and try it soon! I love this idea! 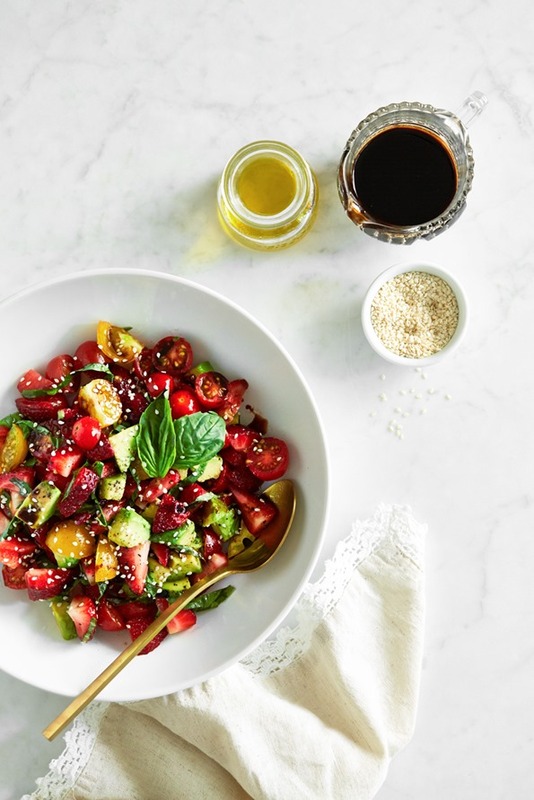 Watermelon and strawberries are such great fruits to add in summer salads! Thanks for this, now I need to go buy some berries. This looks so incredible! I know it’s the morning but I would totally eat that salad right now! Haha! 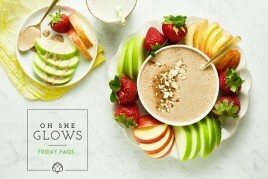 I love that you paired strawberries and avocado! My two favorite foods!!! Haha, I say go for it! ;) I hope you love the salad if you get a chance to try it. The recipe looks great and I will try it! But what I wanted to comment on was Elizabeth’s Gilbert’s fantastically wonderful Big Magic. If nothing you’ve tried gets those creative juices flowing, or if you want overflowing creativity, read this book!!!!!!! I absolutely agree, Elizabeth! it’s such a wonderful and inspiring read. I would agree with much of the advice noted above. Considering the ‘behind the scenes” picture of many successful people I know, if the career is skyrocketing then there is only so much time for just “being” with one’s family. As working parents, we can have it all, but in my experience, not all at once (because otherwise something’s got to give, and hopefully that something is made as a mindful choice rather than inadvertant collateral damage). And this isn’t a gender-specific constraint either: Men with soaring careers have similarly constrained time to be just be available to their families. It just comes down to whether you want to just “sample/taste” the “all” in your life, or “savour” each element more thoroughly. The thing with kids is that they’re just kids for a limited timeframe, so there’s a fixed window in which to savour their childhood, whereas career activities are things that can be scaled up at any point in one’s life. The other thing that surprised me is that the leap from 1 kid to 2 kids can rock your world a bit (feeling torn between two precious creatures) – so if you’re someone for whom doing things really well is really important, I guess the short answer is it’s easier to do fewer things well. Once they hit the teen years they need more space anyway, and that frees up more mental space and time. Good luck! And thanks for all that you share. Haven’t tried this recipe yet but I will. I absolutely loved reading about what has been on your mind lately, and I must say all those ideas sound fascinating (videos *wink*) and I cannot wait to see what your next move is going to be. In saying that though, as inspirational as it is that you’re always working on moving forward in one way or another, cleverly escaping the dangers of stagnancy, I want to reassure you that it’s more than okay and sometimes even beneficial to slow down a little. After all, it’s not solely about the destination, but also -if not, even more so- about the journey. Which is exactly why going at a steadier speed or choosing the long way can turn out to be the better option, as it allows you to observe things you wouldn’t even have noticed or thought about otherwise. Now, as always seems to be the case, I’m not quite sure if what I’m thinking and feeling, is actually what I am saying, but I do hope it makes sense to you and that you are able to grasp what I’m trying to say. Oh the joys of attempting to precisely put out what is inside. Anyway, enough of my rambling, the last thing I would want is to rob you of valuable time. So hugs for now, and have a great Wednesday. Oh and don’t forget: you’re pretty awesome no matter what! Wonderful salad – thank you! Your interest in new opportunities is wonderful. I never “slowed down” with any of my pregnancies. But I did make some pretty big decisions with pregnancy #3. 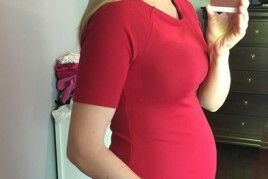 I separated from my company at 20 weeks pregnant, started a new position 6 weeks before the due date, and returned to work 6 weeks after. I decided I wanted a job with zero travel (not even in the immediate area), and also with regular hours (40/week). I also transitioned out of some other industry leadership positions (I held a couple Chair/board positions). This took some effort, but was very healthy for me and my family. Once I had gotten out of most of my formal obligations, though I still did speaking at conferences, attended some events at invitation, I changed my focus to helping other folks who were working on various start-ups. I wanted to help folks out with cool ideas. I’m working with my second entrepreneur now. I give advice, help with contacts, lots of encouragement, and sometimes practical aspects related to investment, price point, etc. The good news is I can work this to my own schedule. This has been a different orientation, but one I’ve enjoyed for the last year. Investing in others is rewarding, exciting, and gives me a chance to learn about different aspects of my field. Next year, I’m going to look into anything else I’d like to do, but am taking it slow. It’s very easy to pile on one good idea/commitment after another, and so lose sight of what you really are trying to do in your life. Perhaps asking yourself what you are trying to do these next couple years – at core, not just in terms of projects – will help you focus on a theme. This will help you stay anchored as new opportunities come along, and take the sting out of saying no, if/when that happens. Good luck! Just wanted to pop-in to say how much I love that quote by Elizabeth Gilbert…she’s a favorite ’round here. And I love reading your always thoughtful, sometimes amusing/sometimes inspriring free-form narratives. Oh, and your ambition is something to behold! (I vote for the idea of opening a vegan restaurant in the US, the Chicagoland area to be exact;) Take good care, Ange! Thank you for sharing that quote! 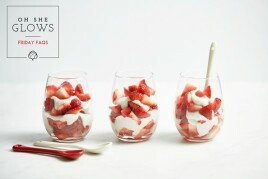 It was so moving and on a lighter note- that recipe looks delicious and perfect for summer! Thanks for the kind words, Caroll! If you give it a try, I hope you enjoy it. I made this for my lunch today and it was A-MAZING! I couldn’t find any basil at my local grocery store, so I threw in some fresh mint instead. It was delicious and really refreshing. Thank you for the inspiration! You do not need to respond to this, since I don’t want to make you any busier than you already are with all on your plate! I just want to weigh in and say that it is great that you and your husband are so ambitious, yet realistic about time and family commitments. While I’m dispensing unsolicited advice, I’ll add something else. My children are 15, 13, and 9, and while I feel like like is a million times easier than when they were little, there are far more schedule restraints. Once your kids are in “the system” of school and organized sports – or music or whatever, and they have friends and social obligations, your time demands are pretty significant. I say this because I always thought that things would get easier when my kids got older, and they have in some ways, but in some ways they have gotten harder. It’s just something to keep in mind when you’re doing any kind of long range planning. Thanks and keep up your amazing work! The advice about not starting something in your second trimester you will regret in your third is great advice, I think. Having said that… PLEASE PLEASE start a meal plan service. OMG I would love that! I have been looking into meal planning services – working outside the home + daycare + early dinner time is not working well if I don’t have dinners prepped and ready to go – but the recipes aren’t all that appealing. A meal planning service from YOU? Yes yes yes! Thanks for sharing the recipe and the book. I’m going to look into it for sure. Thank you for being so open with your struggles you are facing to tackle some new projects. I know it might be difficult to be on maintenance mode when you are in creative overload. It isn’t a race but I think it’s more important that you do what feels right to you. If having a small team lets you focus on what you are really good at and others take care of the rest than that can’t be a bad thing. 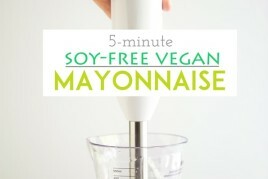 I just made this without the extraneous fats, so no oil and it was great! What I love about your ‘brand’ is that although it grows, your older material is always relevant. Some recipes (like mac ‘in cheeze) are part of my routine, but others (like strawberry spelt cookies) are something that I look forward to making each strawberry season. I don’t feel like I need to see new content all the time for you to keep me as a loyal fan. You’ve given me a solid foundation of recipes and information to draw on, and anything new a wonderful surprise (loving the app!). That said, I will be buying the new cookbook the day it launches. Thanks so much for your lovely words and support Lili! It’s wonderful to hear you’re enjoying the app, and I hope you absolutely love the new cookbook when it’s launched. I’m really proud of it, and can hardly wait to share it with everyone! I miss your glo bars! ? I made this for a bbq yesterday and it was so delicious, everyone enjoyed! 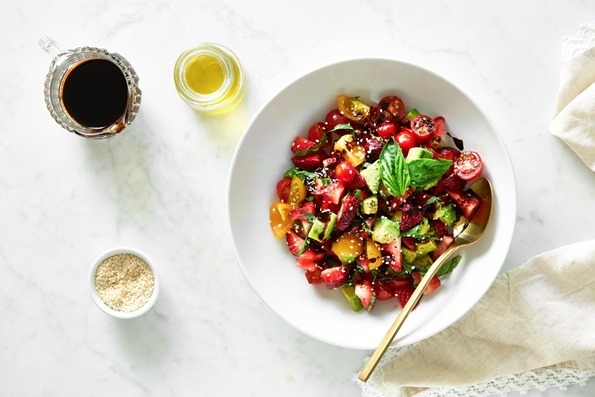 This will be my go to summer salad….quick to make and a real stand out! Yum! Love this recipe! I’m going to try it. I wanted to write you to say that I have been following the recipes on your blog for the past few months though I’m not vegan. I appreciate the healthy, wholesome approach to living and eating well. It wasn’t until recently, however, when I was given news that my current education program where I work is being terminated while I am in my second trimester pregnant with my first child that I have really been eagerly paying attention to your life/career posts. They are giving me so much inspiration and courage to think beyond what I thought was my career. So often I have found I have limited myself and your creative spirit, balance, and focus on what’s important (family, compassion, courage, etc) is truly helpful to learn about. I often wonder “how do people do that? how do you just start something from scratch?” followed quickly by “I could never do that!” I’m starting to believe I can – and starting small is enough.The rest may fall into place. Thank you for writing and for the great recipes! Also, I made the “Lighten Up Summer Granola” by the way this weekend. It is some form of natural crack. So good I made another batch last night and sent to my dad for father’s day. Loved this salad; I skipped the sesame seeds/pecans, but I will definitely do that next time, just to take it to the next level. I turned down a promotion when my twins were about a year old; I agonized, but in the end, just felt that the extra money wouldn’t balance out the additional ‘pull’ on me – I wanted to be fully present for the kids. Now I’m ready and just interviewed for a spot, so we’ll see… No right or wrong answer, but it sure sounds from all the comments that you’re not alone in the agonizing! And it’s the fact that you care so very much that will ensure your kids know they’re very much loved – regardless of your choices! This salad is simply amazing!. I followed the recipe exactly using toasted pecans. If I did stray at all it was with the tomatoes. I used a variety of heirloom cherry tomatoes. I would suggest drizzling a little of the reduced balsamic on the salad and then serving it with the rest of the balsamic on the side for people to add if they wish. It seemed a little heavy on the balsamic, but that’s just me! Perfect summer side salad. Made this tonight and it was excellent!! Did the version with the pecans. Perfect for summer. My husband loved it as well. Definitely a keeper! Thank you! It’s so great to hear you and the husband enjoyed the recipe, Diane! You’re right, it’s so summery–I can’t get enough of it! I stumbled upon your website today while looking for a recipe for kale chips. Needless to say, the chips came out perfectly crispy and wonderful, but I think I added too much cayenne pepper because they are too spicy for me! That being said, I will try some other toppings, but I am so excited that your recipe worked so well. I am looking forward to trying others. Everything looks amazing! Hi Lynn, It’s wonderful to hear that the kale chips recipe turned out well for you (if a bit too spicy! haha). Enjoy experimenting with the seasonings, and thank you so much for taking the time to leave such a lovely comment! 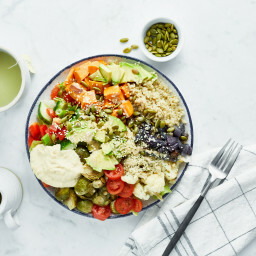 Fabulous salad! Enjoyed it a few times. Now that strawberries are no longer local, am looking for a substitute. I made this for lunch today and it was so amazing! I knew it would be when I saw the ingredients. This will be my new favorite salad. I only made one change. I added a handful of kale which I massaged with sea salt, balsamic vinegar and olive oil until it was softened. I then followed the rest of the recipe as is using fresh basil from my garden. YUM!. I think it was the best salad I’ve ever eaten. Thank you! I’ve recently discovered your blog, and I can happily say that this is the best cooking blog I’ve ever read. I’ve tried many of your recipes and my family knows your name very well now. I think I’m speaking from everybody’s name who doesn’t have the imagination for creating an outstanding recipe – A BIG THANK YOU! It would be amazing if whenever you posted a recipe, that you could include suggestions to serve with it. They could be links to other recipe of yours perhaps. It would just make that much easier when trying to prepare a menu plan for my week. And I am sure other people would like that as well. I really hope you consider this. Thanks for being so awesome!! I have made the Caprese salad three times now and it is fabulous! Thank you for this wonderful recipe (which I double). I’ve tried a few of your recipes and love your book! Thank you! Quick question: are the pecans roasted as well or only the sesame seeds? Hi Gaby, Thanks for the love! The pecans should be toasted, as well (though it’s still great untoasted too). Hope this helps clarify! This has got to be one of the best recipes ever! So colorful and with a burst of summer flavor. Thank you so much! I’ve shared it on my FB site “Super Quick Plant-Based Recipes” (where I share recipe sites that offer PB recipes that take 20 min or less to prepare). https://www.facebook.com/SuperQuickPBRecipes/ I think my group will love it and your site! Aw, thanks for the shoutout, Shanasy! Previous post: Friday FAQs: The recipes/foods I packed for the hospital, veggie-heavy summer recipes, canned coconut cream, and more!